Product prices and availability are accurate as of 2019-03-28 05:16:50 EDT and are subject to change. Any price and availability information displayed on http://www.amazon.com/ at the time of purchase will apply to the purchase of this product. 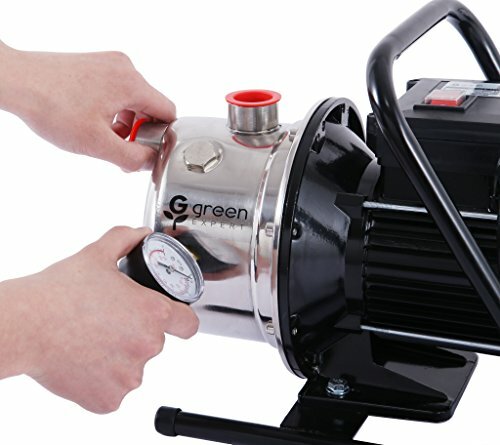 Green Expert 1HP 314052 shallow well jet pump has the superior performance with max 148 Feet water delivery height at max shut-off pressure 65psi, well-assembled with corrosion-resistant stainless steel pump body, energy-efficient PSC motor with automatic thermal overload protector for safety. This item can be easily equipped with pressure gauge to have attention on working pressure obviously. The sprinkler pump is designed for common 115V, 60Hz. 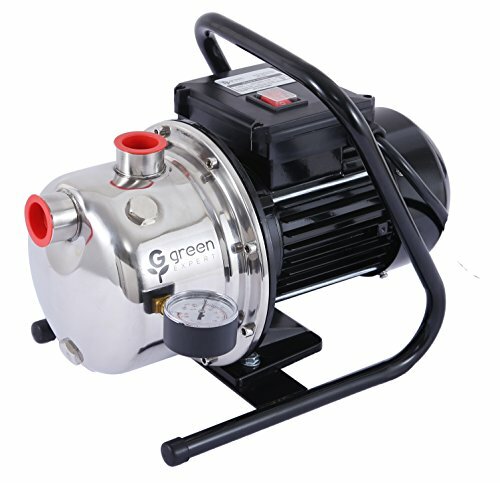 After pump housing is filled by water in first usage, this item will be conveniently self-priming. 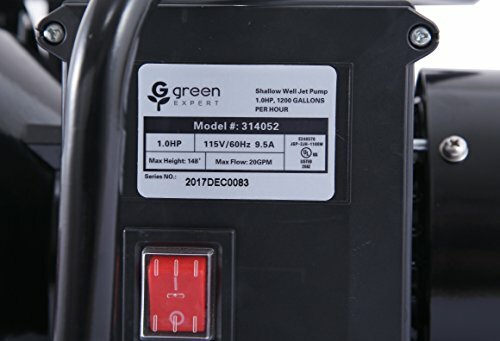 This jet sprinkler pump is a versatile pump for pressure boosting, small underground sprinkler systems, operating lawn sprinklers and the multitude of other general purpose applications. Both for indoor and outdoor use. Die. of pipe: NPT 1"
We provide a 1-year limited warranty for the sprinkler pump from date of purchase. Please read instruction manual carefully before operation. 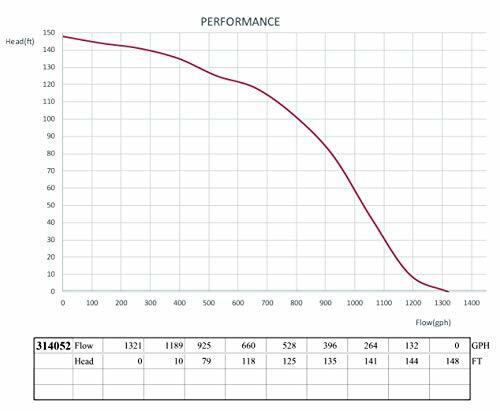 1 horsepower heavy-duty engine with thermal overload protection, has the ability to deliver water to maximally height 148 feet with max pressure 65 Psi; Remove max 1200 gallons water per hour. Corrosion resistant stainless steel construction with steady performance for durability. 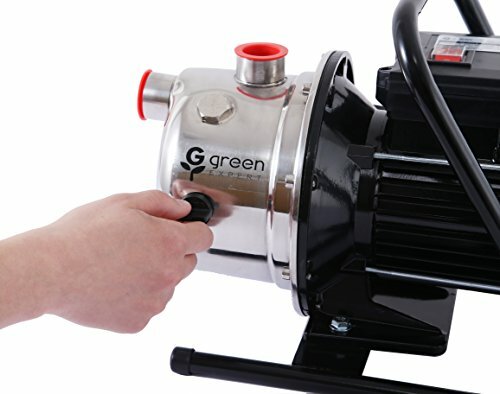 Self-priming after pump housing is initially filled. Portable L type handle for easy move by using. 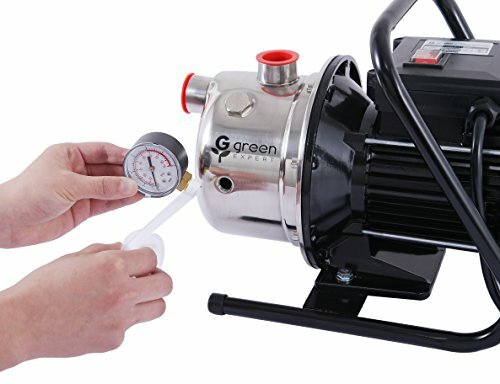 Present with a useful pressure gauge with the sealing tape in one well-packed gift box; UL certificated with one-year limited warranty.